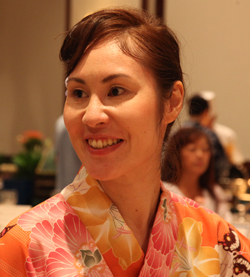 Haruka had thoughts of telling the world about Japanese culture during her time spent studying and working in the US. Soon after returning to Japan, she founded MIKOTO with her sister in 2006. They created their original concept, “international Wabijin” and started their business based mainly on kimono-related services. Proposing a lifestyle with kimono, they hosted yukata parties in Tokyo, a kimono dressing service, held kimono/English lessons etc. and proceeded to set up “i-Wabijin Online Salon”, a website written in English about Japanese kimono for their overseas audience. After several years of founding Mikoto, to their surprise, the sisters discovered that their grandparents had owned Oshima Tsumugi kimono factory in Amami-oshima. (That was over 100 years ago!) They then felt an even stronger connection to kimono. Today, Mikoto has a kimono coordinating team, and continues introducing the attraction of a life with kimono. Haruka is the mother of a 7-yr old son and a 5-yr old daughter. She learned the great potential of human abilities by having some training program to flowering whole brain for her son in his 5 month old. He now has high concentration, good memory, a large vocabulary, good imagination and a droll sense of humor, and makes everyone laugh everyday! Her daughter is not less droll than her big brother, but is a sensitive and tough-minded girl. Whilst continuing to raise her own children, she is seeking a better way to live. She has found that a woman has a big role and can be very influential to people, and sincerely wants to get involved with expanding the possibilities of women. That’s why she set up i-Wabijin Online Salon with original concept and started producing i-Wabijin helping to draw on women’s creative lifestyles. She has been extremely interested in education and became aware of the fact that “Education can change a person” through her own career business training., Specifically, she’s been utilizing Mindmap by ThinkBuzan for many years and found it takes advantage of developing creativity. She is qualified as an official mind map instructor to utilize mind map to draw out women’s creativity. Doing lots of activities with her children, looking out at the sea, karaoke, eating out with friends, listening to music, playing the piano, kimono fashion, manga (Japanese comic books), reading books.